Midline of the maxillary rim – Use a #7 wax spatula to score a line demarcating the position of the midline of philtrum of the lip. This is one of the most critical references to record. Ensure the mark is a line, not just a dot, which parallels the patients overall facial midline. Otherwise the incisors can be set at an angle, making the set up look off center. The mandibular midline can be marked at the same time. High Lip line -Use a #7 wax spatula to mark the highest point the upper lip reaches when the patient smiles. The maxillary anterior teeth should be selected so the cervical necks lie at or above this line. If shorter teeth are selected, the esthetic result will be compromised. 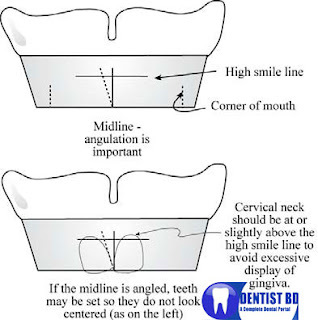 Palatal Midline – With a pencil (NOT an indelible stick) and a straight edge, draw a line through the middle of the incisive papilla and the mid-palatal raphe, extending it onto the land area of the cast. Check your occlusal rim for symmetry about this important midline. If it is not symmetrical, adjust the rim prior to sending it to the lab for placement of teeth. Distal aspect of the incisive papilla – In the edentulous maxilla, a line drawn perpendicular to the palatal midline, passing trough the distal aspect of the incisive papilla should normally intersect with the cusp tips of the canines. Draw this line with pencil and a straight edge, on the cast, extending out to the land area. It will provide verification that your tooth size selection was correct. Additionally, it will provide another line to verify the symmetry of the wax rim and denture tooth setup. On average, the facial surface of the central incisors should be approximately 8-10 mm anterior to this line.